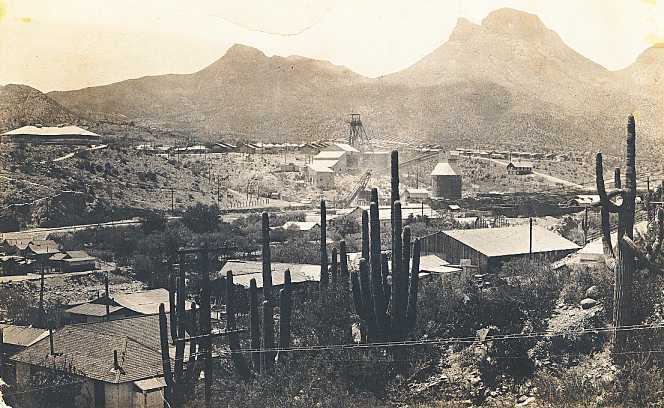 Pictures, narrative, and comments from those with family connections to .Ray and .Sonora, Arizona. I would appreciate any help in pinning down the year." email-Jan. 2007. .Gary's mother .Wilma (.Hise) .Spargo is listed with the 1950 graduates. His father .Tod graduated from .Globe HS. Grandmother .Ruby .Spargo taught elementary school in the 1940's and 50's. 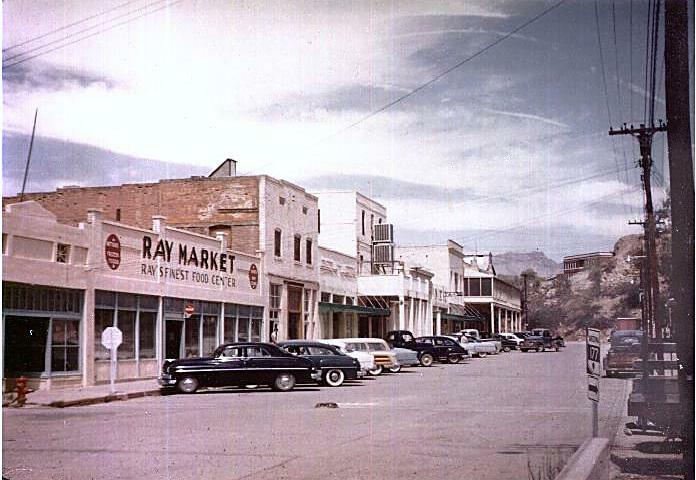 He provided this 1961 picture of downtown .Ray. 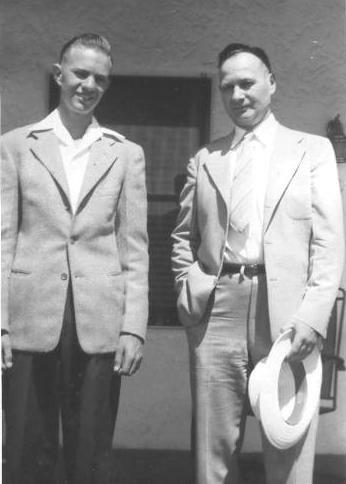 This next picture is of .Gary's father, .Tod, before a hunting trip in 1945. .Tod .Spargo, .John .Rich, .Tom .Morton, unidentified and (in the background, .Tom .Spargo, .Gary's grandfather). The picture was taken in front of Tom's house at 711 .Boyd .Heights. I wasn't a hunter. I do remember fox, rabbits, and porcupines (gila monsters, chuckwalla, lizards and scorpions, too) in the area. Quite likely .Tod and his friends were hunting deer, or possibly javelina hogs. --ovk .Tom .Morton's name provided by .June .Morton, 10-19-2002. My family moved to .Ray in 1950. My dad drove the huge Euclid dump trucks and we used to watch him for hours, taking him coffee and snacks. We could get quite close to the trucks in those days. I don't recall the street names of our houses, but we lived in a .Wingfoot (name of the builder) house across the street from the Baptist Church and just up the road from the grade school. We moved out (of) the tiny, one bedroom house (to a home) across town near the mine hospital. I recall .Wingfoot as a Goodyear Tire Corporation name. 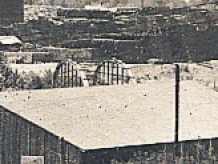 The Goodyear plant in .Litchfield, AZ, made prefabricated homes I think, but the web doesn't offer any confirmation. I guess I was too young to even be aware of the hospital. Can anyone help with information about the doctors?--ovk. email--referring to the picture of downtown: "From the auto on the left, the year must be on or near 1962. The building in the center, looking down the street is the grade school. 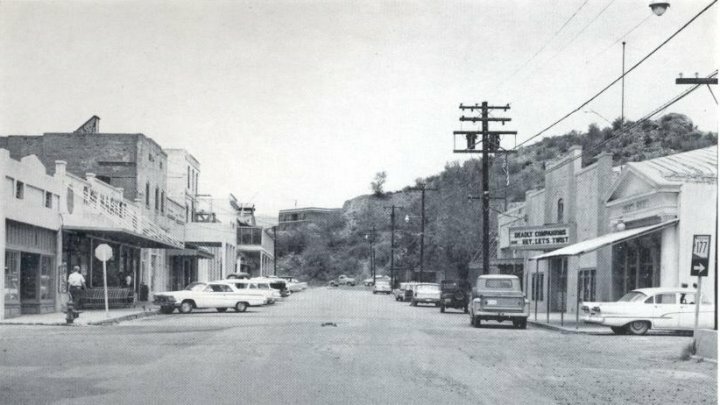 The first building on the left is the drug store and the second building is, I believe, Eddy Bashas' first grocery store (now a big time grocer in Arizona, Nevada and New Mexico). ** Next to the grocery store is the party hall where dances were held and the Boy Scouts met. Next is the hardware store. On the right side is the City Hall and Police Station, the movie house, .... Further down and on the right side is the old Post Office where we went to get the 'huge' package of plastic soldiers we ordered from the back of a comic book. At the far end of town on the left was the hotel where we stayed when first arriving in .Ray, and on the right was the Miner's Mercantile grocery store where we had credit. The street appears to be dirt, but I remember it being paved, but continually dusty. Thanks for the memories and thanks to the person sending it to you. - .John"
**John adds: From Bashas' website: "In 1910, Najeeb (Bashas) moved to .Ray, Arizona, initially joining some of his wife's family in a mercantile business. After his wife and family joined him in Arizona, Najeeb opened his own store, which later burned down. " email "I too stumbled across a 'machine gun nest' in Hayden. It seems very similar to the one you described in your web-site. I asked my dad if that was what it was. We kids already knew it was to wipe out Krauts and/or Japs. He said that it was a 'provisional pumping station.' Made some sense, there were a lot of old pipes and piping in the thing. Also, looking back it was in a terrible spot to be anything defensive or anything of that nature." 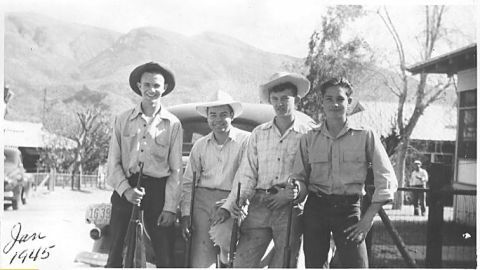 .Frank's father, .Frank, and uncles; .Victor, .Louis, and .Aurelio; were from Sonora. .Louis and .Frank worked in the underground mines for a while. .Louis was among the first killed in action during World War II. The American Legion post in Sonora was named after him. .Victor .Amador graduated from .Ray High School in 1955 or 56. He became a dentist. .Frank has a picture of an uncle with a girlfriend by the city water tanks--tanks which were not taken by the .Ray Mine and are still visible alongside the road past the mine (see *ovk). .Frank spent summers in Sonora visiting his grandparents who had a store in Sonora that specialized in snow cones. They were forced to move to another city in 1953. The store was across the street from the city swimming pool and city jail. A grand uncle, his grandmother's brother, Mr. Lomeli (Italian name but from Mexico) had a jewelry store. .Frank recalls doing chores for him--sweeping out and picking up soda bottles. .Frank also recalls a friend--a Sonora police officer named Santana--who committed suicide in the city jail in the early 1960's. The following picture is much like .Gary .Spargo's picture but some years later. Color film and the cars are two major changes. It may be from 1955. A caption on the picture states, "From the left of the photo is the dry cleaners, then George Milton's .Ray Market, then the library. Next comes the Boy Scout building with the green awning (ovk-this side of the two swamp coolers**).On the other side of that comes the Copper Queen Cafe, the barber shop, .George L. and .Grace .Morton's .Ray Drug Store and the hotel. In the bottom of the hotel was .Mary .Hunicutt's flower shop and in the '60's a beauty shop. The mountain in the background is Sleeping Beauty and the red brick building at the top is Lincoln Elementary School. Assembled by ovk. Last updated 01/22/2007.